Every time I travel somewhere I tend to investigate some of the best photo spots. The same happened before I went to Berlin. To me, it is always a struggle to find good sources of people that really went to the places they mention – sometimes I feel like they just mentioned every famous place in a city they know. That’s why I created this “Photography in Berlin” guide – featuring some of the best places to take pictures in whole Berlin from people who have actually been there. Together with some fellow bloggers, I put together this list of 10 amazing photo spots for my photography in Berlin. Let’s directly start off with the most classical place in Berlin for me. 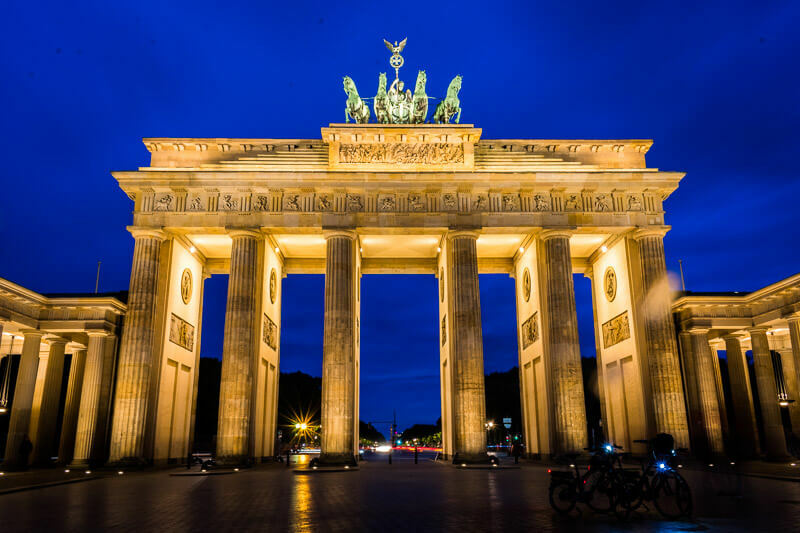 It’s also the best-known landmark in whole Berlin and famous all around the world. I know this is not an insider tip at all, however, it has to be on the list. During the day this tourist-attraction is highly crowded all the time and it’s hard to take a good picture in my opinion. I would definitely go there at night though! Not only is it less crowded, also will it shine in the light of many spotlights and become even more gorgeous. Your best bet will be to take a long exposure image – however, you will need the right photography equipment for that. I personally didn’t get the result I wish due to the fact that it started to rain and I had to protect my camera with an umbrella. (Yes, I got wet instead of my camera!) Still, this is for sure one of the best places for photography in Berlin. The next location is a waterfall in the middle of the city. What? Yes! You can find it in the Viktoriapark, which is located in the area of Kreuzberg. Basically, this park offers one of the best views over whole BerlinBerlin. For that, you just need to hike up next to the beautiful waterfall and you will reach the peak of a little hill from where you can see most parts of the city. Absolutely worth it, especially when you want to take a great image. What made this park special to me was definitely the waterfall itself. There are several huge parks inside cities all around the world, like the one I visited in Sao Paulo, but most of them will not have a waterfall. I mean I’m used to waterfalls in Switzerland, still, I asked myself how is this even possible? The solution was quite easy: The waterfall in the Viktoriapark is an artificial waterfall, which means that it is just an imitation of a natural waterfall. Though, it was definitely one of the best photography spots in Berlin for me. If you are a photography freak you can even climb on the wet rocks inside the waterfall to take a better picture – you will just be the main attraction of everybody else while doing it. Street art is a big thing in Berlin, but nothing new. Art can be found all across the city since over 30 years. And there are some highlights, such as in the Oranienstraße in Kreuzberg, where there is a huge mural that shows an impressive faceless astronaut. The street artwork “Astronaut / Cosmonaut” was designed by Victor Ash in 2007. In Berlin’s Kreuzberg district, the mural “Yellow Man” was created in 2005 as part of the second Backjumps Live Issue in the Kunstraum Kreuzberg/ Bethanien. 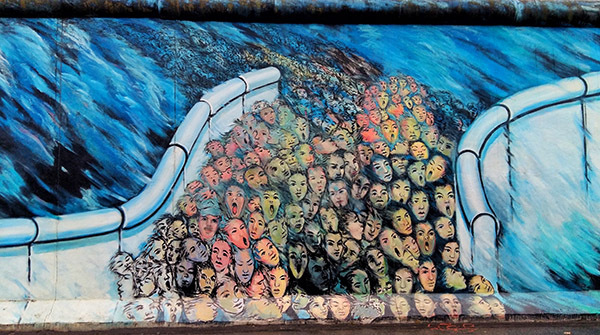 And quite traditionally, part of the Berlin Wall has been transformed into an art gallery, the East Side Gallery. Here you can walk along and learn more about the topic of the division of Germany in the form of art. It’s like a walk through the history of Berlin. 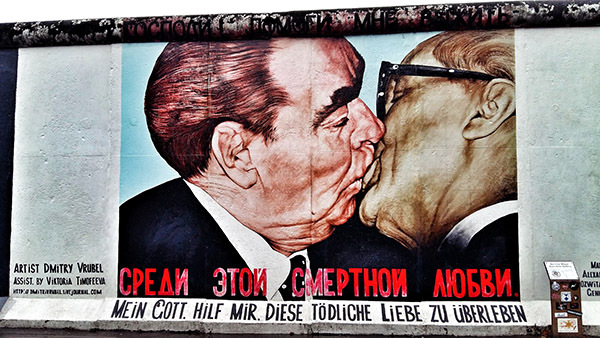 A particularly famous painting and favorite photo spot is the passionate brother kiss between the Soviet leader Leonid Brezhnev and Erich Honecker, the leader of West Berlin. There are several places in Berlin where you can still see sections of the Berlin Wall. There is a section next to the Topography of Terror Museum which is pretty much how it used to be; plain sections of concrete, now chipped, and carved with graffiti but still shocking to see. The longest section of the wall still standing, and my favourite place for photographs of the Berlin Wall is the East-Side Gallery. When the wall came down, artists from all over the world were invited to paint on the east-side of the wall. The result is a series of murals stretching over 1300m long, sharing memories of life when the wall was standing, and warnings about never allowing this to happen again. The East-Side Gallery is heaven for photographers and Instagrammers, which iconic murals such as Dmitri Vrubel’s “FraternalKiss” and Birgit Kinders’s Trabant breaking through the wall, as well as dozens of other striking paintings that really stick in your mind. We should all remember that building walls isn’t usually a good idea. Passionate brother kiss between the Soviet leader Leonid Brezhnev and Erich Honecker, the leader of West Berlin. As we already know Berlin is internationally renown for its street art and rightfully so. You’ll find beautiful murals all over the city, but most tourist who visit Berlin head straight for the East Side Gallery. We found a more authentic experience by visiting the little known Haus Schwarzenberg Street in the Hackesher Markt. The entrance is a bit hidden, but it can be found just to the right of Cafe Cinema. Once you pass down the narrow alleyway you’ll find several courtyards of vivid street murals and bizarre sculptures. The walls of this alley are a constantly changing canvas for several famous Berlin artists and but one long-standing staple is a well-known portrait of Anne Frank painted by Jimmy C on one of the walls. For a real adventure come back after dark and you’ll find the alley taken over by Berlin hipsters parting at the tiny bars tucked throughout the street. First of all, the history of the Holocaust memorial in Berlin is really sad and you should be respectful if you visit this place. I saw many people walking and even jumping on top of the memorial, which is, in my opinion, extremely disrespectful. I don’t want to preach a huge story now – but there are ethical borders that you should think about. Anyway, this place is amazing to take creative pictures. With its moody atmosphere and the interesting style of “architecture2, you can play with it quite easily. What I did: I put my camera on my tripod and started a long exposure shot. While my camera was capturing everything we walked in front of it, made some poses and got a ghost-like result which was quite amazing! 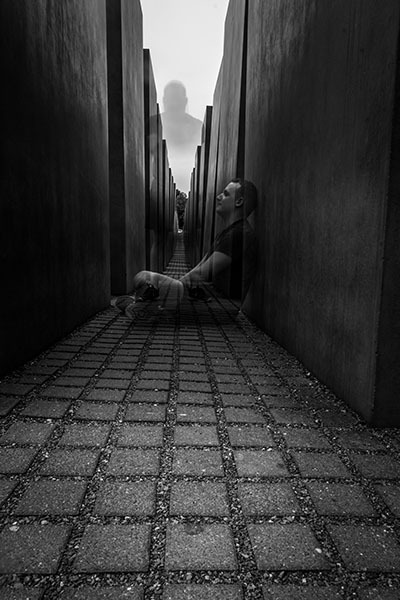 The Holocaust Memorial is, therefore, one of the best places for creative photography in Berlin. This is the crossroads between East and West. The spot that marks the contrast between old and new. 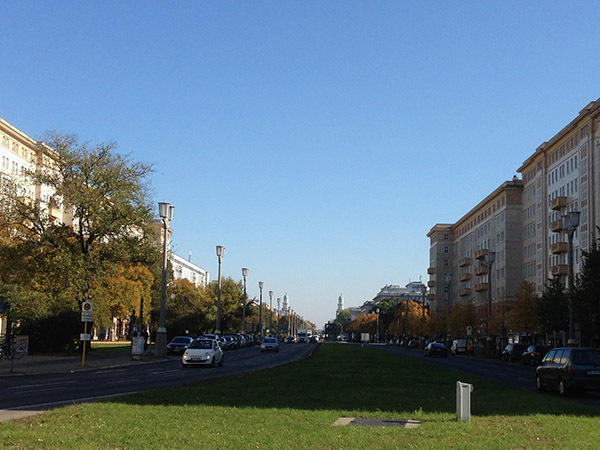 Stretching for several kilometers is the lengthy Karl-Marx-Allee, a symbol of drab, grey post-war communist architecture. A trip back in time to the DDR era provides a mixture of fascination and revulsion. A reminder of a very repressed era but with an optimistic eye on Berlin’s ever-changing present. On one side the emblematic TV Tower of Alexanderplatz stands and to the other are the twin gates of the Frankfurter Tor. If you want to find a location that serves as the perfect meeting point of Berlin’s past, present and future then this is that location. The unmistakably dreary architecture has certainly left its mark. Shops, apartments, offices, bars and even a brilliantly quirky computer museum are all to be found here under the gaze of Socialist Realist architecture. Few streets in Berlin best sum up the city for me like this. A city that endured a very turbulent 20th Century but continues to embrace the re-invention and creating more positive memories for the 21st Century. One of our favourite photo spots in Berlin is the Fernsehturm TV tower. This is one of the city’s most iconic monuments across the skyline. The Berlin TV tower is 368m (1,207 ft) tall, making it the highest structure in Germany and one of the tallest in the EU. We particularly like it for taking photos of Berlin because it has an awesome revolving restaurant called the Telecafé. At 207m (679 ft) high, this is the highest revolving restaurant in Germany. It does a full circle over 1 hour. We recommend coming here for a drink or romantic meal at sunset for the best 360-degree views across the city. On a clear day, you can even see the distinctive dome of the Tropical Islands theme park, which is over 60km (37 miles) away. I’ve been visiting Berlin in winter every year for the last five years, and I never get tired of exploring. One of my favourite places in town is Tempelhof airport – not just the outside area, that was turned into a public park when the airport ceased to operate, but indoors as well! Tempelhof is a truly unique building, one of the few surviving examples of buildings constructed during the Nazi period. It is only walking inside that you get an idea of how massive this place is, and how many hidden secrets it contains. However, my favourite place in Tempelhof is the roof, where you see a fantastic view over Berlin and the former airport runways. Tours of Tempelhof airport always include a stop on the roof – don’t miss it! Most people don’t realize just how many bridges Berlin has (at least 1,000 but as high as 2,100 depending on what you count as a bridge). The River Spree snakes its way through the city, and then there’s also a bunch of canals and minor tributaries that all offer fabulous vantage points from their various bridges. One bridge that’s right in the heart of the centre and offers a lovely perspective is the Ebert Bridge (Ebertbrücke). From Friedrichstrasse Station, it’ll take you about five minutes to walk there! 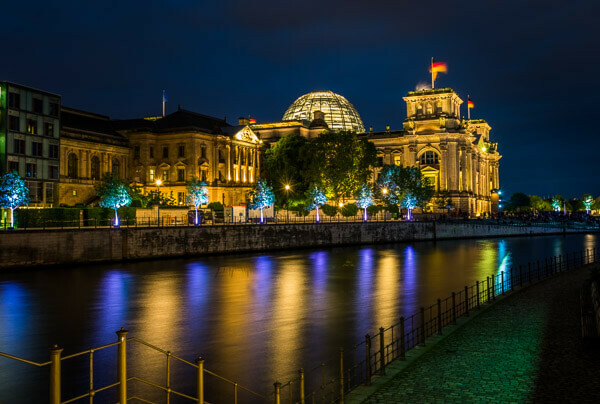 Once you hit the Ebert Bridge, you are basically on the doorstep of Museum Island (Museumsinsel) so not only do you get fantastic views of the rotund Bode Museum (Bodemuseum), but you’re also directly on the Spree and can admire the TV Tower (Fernsehturm) looming in the distance. For an even closer view of the Bode Museum, walk up to the Monbjiou Bridge (Nördliche Monbijoubrücke). From here, you’re a stone’s throw away from incredible museums like the Old Museum (with its stunning symmetry of the ionic columns gracing the entrance), the New Museum, the Old National Gallery (with its gorgeous tiered staircases and nearby columned walkway) or the ever popular Pergamon Museum. 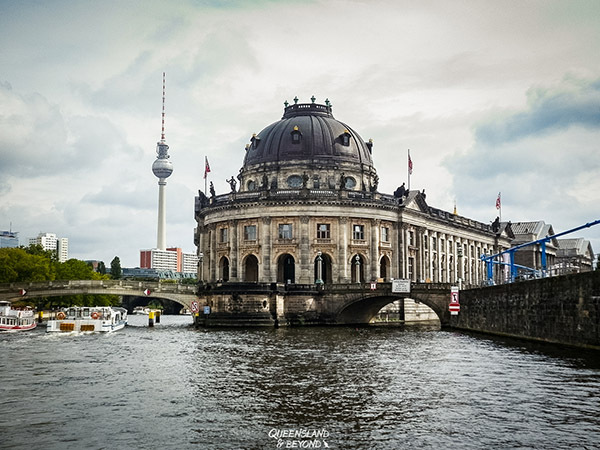 Just walk around the Museum Island, you’re guaranteed to find some fantastic angles and photo spots! Do you want to know what you could get in Berlin for 10$? Check out this post. 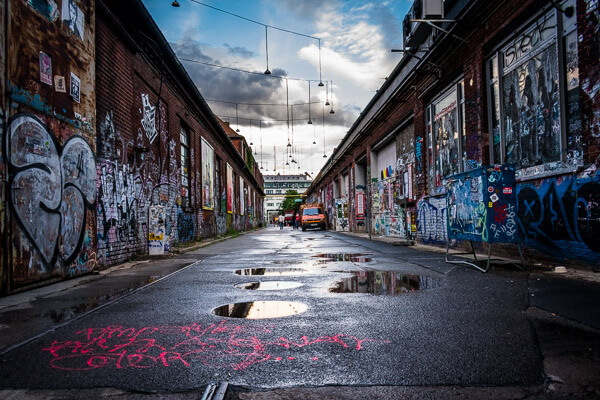 Have you ever been to Berlin and know about other great photography spots? Let me know in the comments!